This weekend sees Open Doors London launch their second London borough exhibition, SW4. This pop-up gallery network, who I have posted about before, have an eclectic mix of artsits showing works at Clapham North Arts Centre this weekend. As previously, like with Exhibition W12, the artists have been inspired by the area and Open Doors have helpfully uploaded images of the Clapham area to their digital scrapbook of to ignite creativity, see it here. The exhibition is open 3-4 December at Clapham North Arts Centre 11am – 6pm, so catch it while you can! 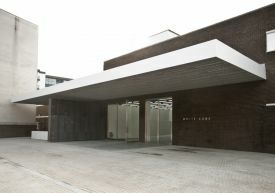 White Cube Bermondsey, Photo: Ben Westoby. Funding cuts aplenty and rent price hikes it’s no wonder galleries are tiptoeing around trying to make the best decisions when it comes to their businesses. So there was surprise when art collector Jay Joplin announced the opening of his third London space – White Cube Bermondsey.